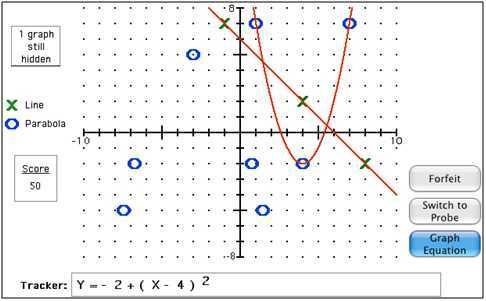 Equation Grapher, Linear & Quadratic Graphs, Green Globs, and Tracker. It also contains Teacher Options, which are tools for the teacher to manage Records files. Relating Graphs to Events and Escape!. 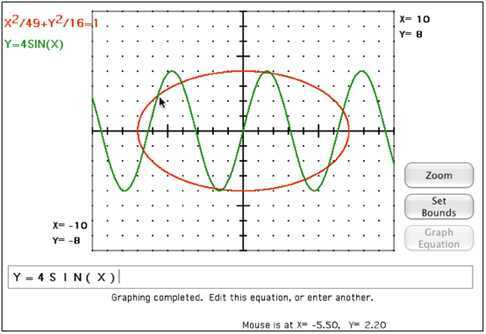 Equation Grapher is a utility program that plots the graphs of entered equations. 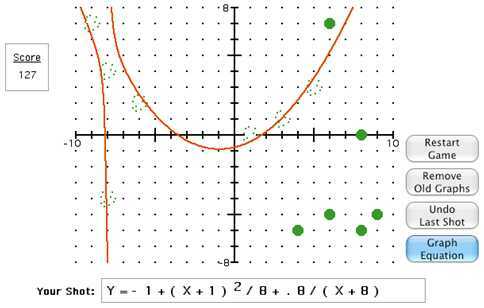 Linear & Quadratic Graphs displays a graph of a certain type (line, parabola, circle, ellipse, hyperbola). 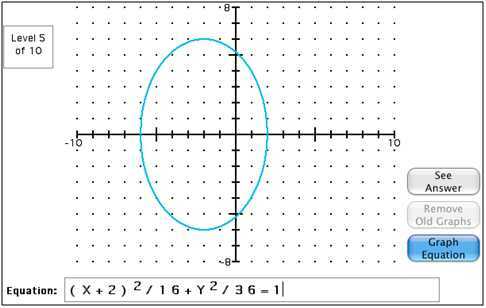 The student enters an equation that matches the graph. Green Globs is a game in which thirteen green globs are randomly placed on the grid. Students earn points by entering equations that pass through as many green globs as possible. Tracker is a game in which graphs are hidden on a grid. The student gathers clues to determine the equations of the hidden graphs by using “probes” (horizontal and vertical lines) to find the location of the graphs. 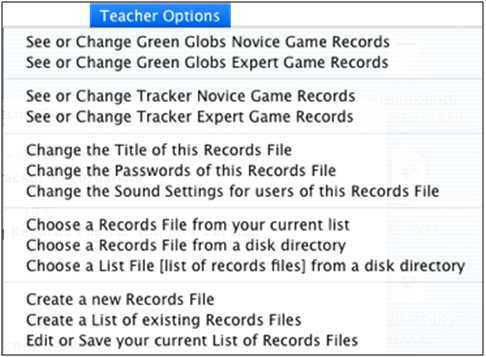 Teacher Options provides tools for the teacher to manage the Records file(s). A Records file holds the top ten scores recorded by students playing Green Globs or Tracker games. The PC version appends two menu items for converting Records files and List files from the previous PC version to the format of the new PC version. Relating Graphs to Events involves interpreting line graphs qualitatively, recognizing the general shape of the graph as it relates to the labels on the axes. In each of twenty practice problems, three line graphs are plotted on one set of axes. The axes are labeled to indicate which variables they represent. The axes do not have numerical scale markings. A brief description of a physical event is displayed below the graphs. The student selects the graph whose shape most closely matches the described event. Escape is a game in which students use graphs as diagnostic tools, translating changes in a graph into the related changes in an event. A city map is represented by a rectangular coordinate grid. Bank robbers try to escape from a bank at the center of the city to the city limits at the edge of the grid. Students try to trap the robbers by setting blockades. The robbers' path is not displayed until after the game ends. Students must make blockade decisions based on information obtained from a graph of the robbers' movements. Students choose one of three graphs. The graph may provide only part of the information needed to specify the robbers' position. Students must decide what the graph tells them, what it does not tell them, when and what to estimate, when specific function values are important, and how to use this information to set blockades.